Initiated by DeltaSync, the Floating Pavilion is intended as a pilot for building on water and a first step towards floating urbanization. 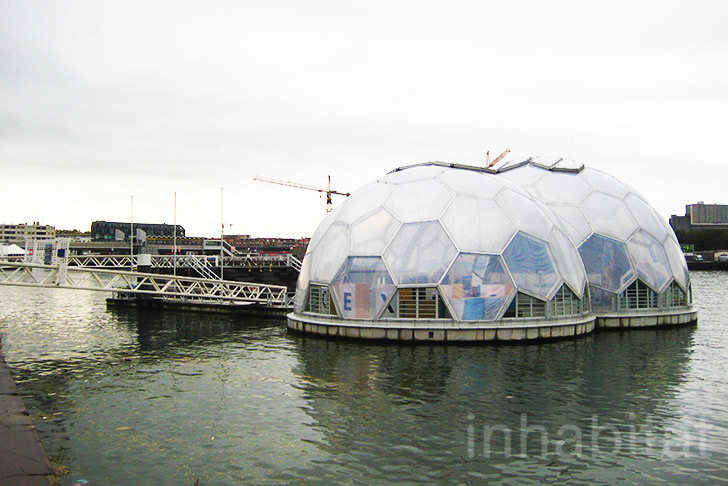 The pavilion is a pilot and a catalyst for floating construction in Rotterdam. It consists of three interlinked spheres, the largest of which has a radius of 12 meters. The floor space of the pavilion island is over 46 to 24 meters. The pavilion is located in the Rijnhaven. This port is very suitable for the pavilion because of its moderate waves. The nautical use the Rijnhaven by inland ships has been decreasing since the port is destined to be a future leisure port. The Rijnhaven is well served by public transport, also over water. Aiming to be the World Capital of CO2 by reducing fifty per cent its carbon emissions, Rotterdam has ambitious plans to adapt to rising sea levels. The idea is to build a community of floating homes, and this charming Floating Pavilion is their first prototype, presently used for exhibitions and events. 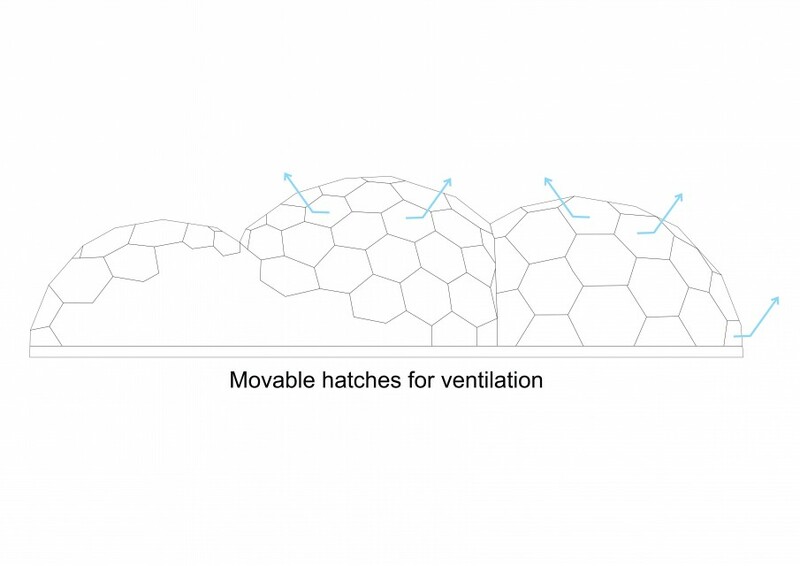 The innovative pavilion meets an increasing demand for climate-proof shelters that are as flexible and self-sufficient as possible. 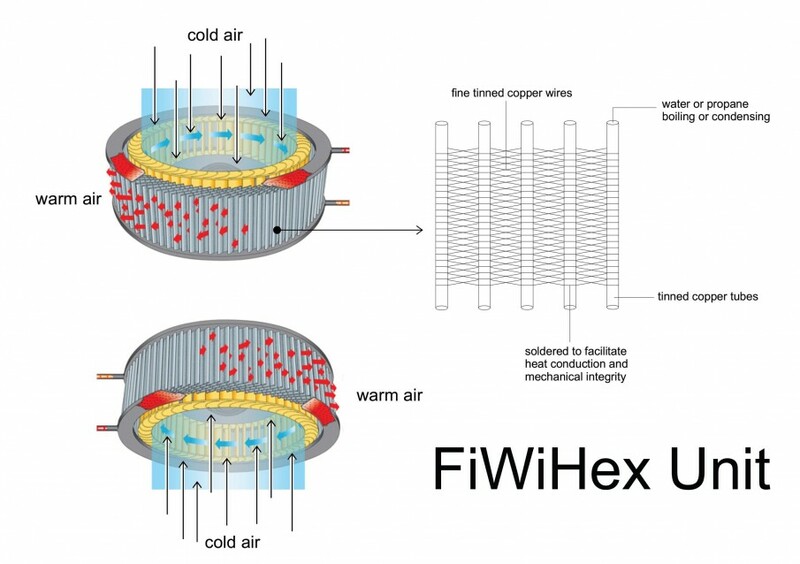 To heat and cool the rooms, under- floor heating and FiWiHex- units (efficient heat- exchangers) are used. This heating system is sustainable because it is a low- temperature heating and it uses radiation instead of convection of heat and cold. The exposition space is passively heated by the sun and by lock ventilation. In the facade, large hatches and glass slats were placed that can be opened for ventilation. 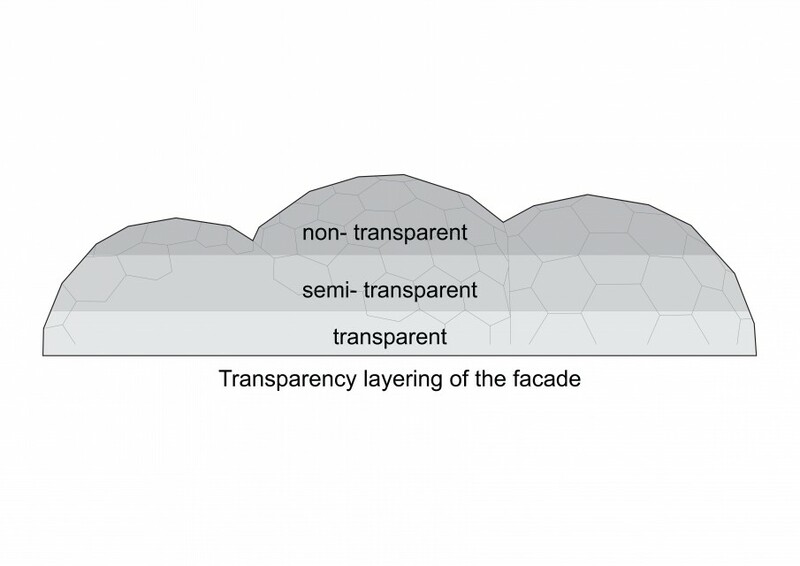 To prevent too much exposure to the sun, the cushions on the facade differ in transparency- they are less transparent in the higher layers and more transparent in the lower ones. This area serves as a transition space between the inside and the outside, with maximum temperature of 15 degrees C. The auditorium (the smallest dome), however, has vacuum- tube solar collectors placed on the ceiling which gather the Sun's warmth to transform it into cooling. This sounds like a contradiction but it is based on the process that also takes place inside the human body- evaporation. This cooling system is called adiabatic evaporative cooling and works via an intelligent air- treatment cabinet. The Pavilion also purifies its own toilet water using a three- tank IBA system, which consists of three different purification processes which take place in three separate tanks- physical, chemical and biological purification. Drinking water is also purified and is re- used as rinse water as much as possible. Whatever is left can safely be discharged into surface water. Every strip of land ánd every strip of water is precious in a highly dense country like The Netherlands. 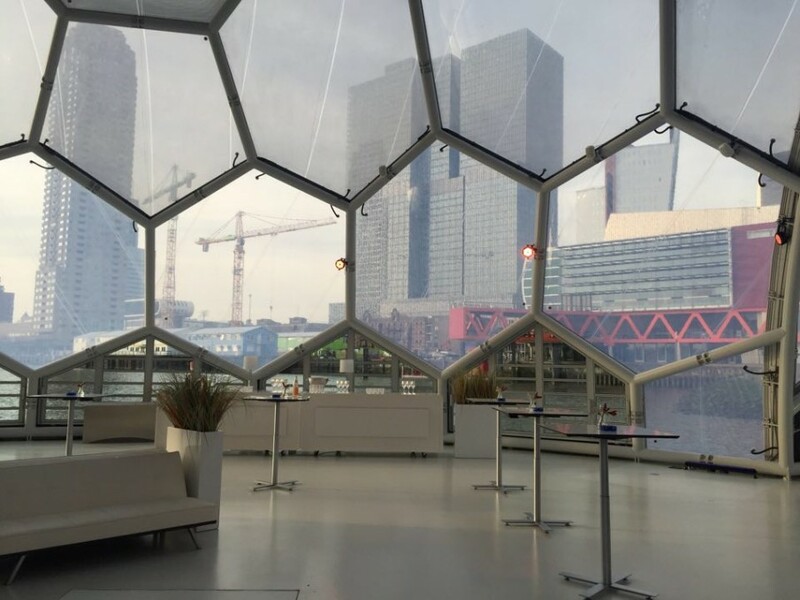 The Task Force ‘Rotterdam Climate Initiative’ has been established to study building constructions in areas outside the dikes. The floating pavilion is the first result. 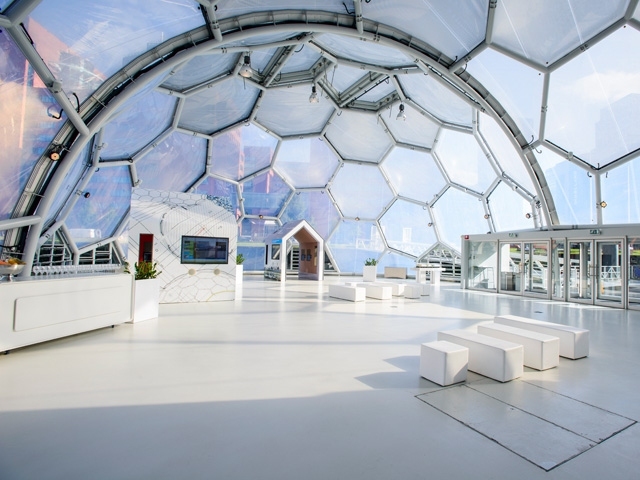 Important objectives of the new Pavilion are to showcase ways to reduce energy consumption and CO2 emissions, in line with the Rotterdam Municipality objectives of 50% CO2 emission reduction by 50% by 2020. The Floating Pavilion was designed by local team DeltaSync and PublicDomain Architects and constructed by Dura Vermeer. 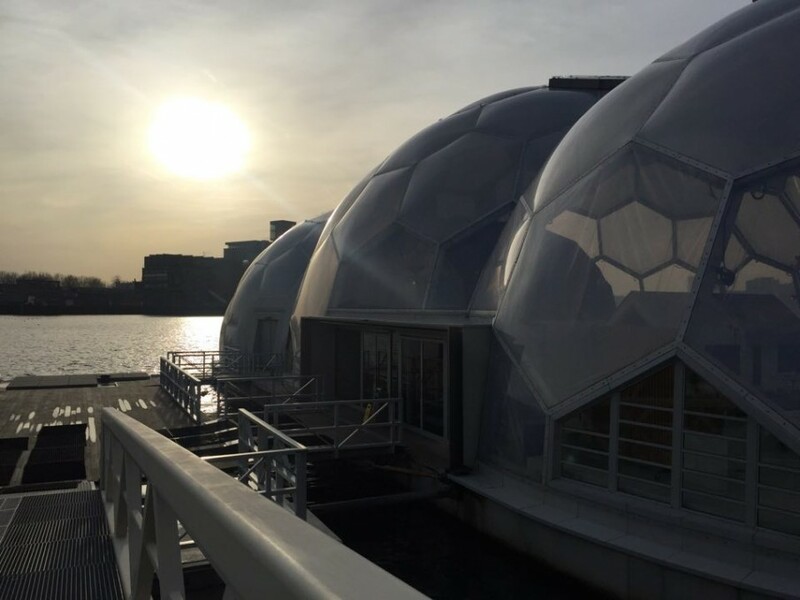 For the past five years, the complex has been serving as an expertise centre for demonstrating innovative and inspiring methods for tackling climate, energy and water issues. 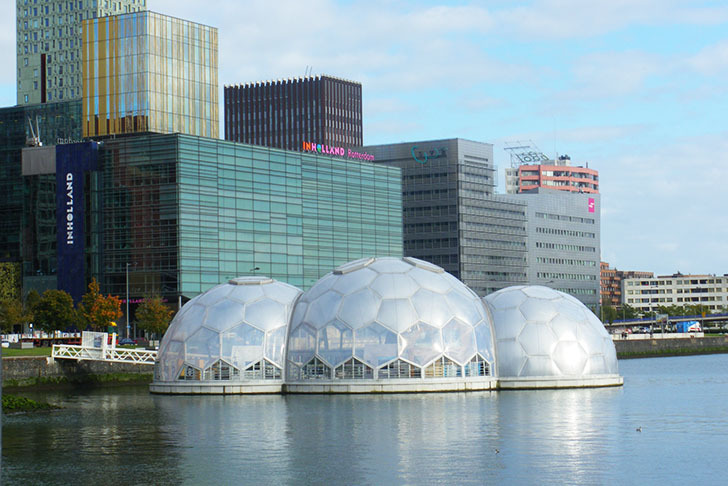 This focus makes the pavilion the showcase and prime venue of a number of water management organisations such as the Rotterdam National Water Centre, which is currently being set up. 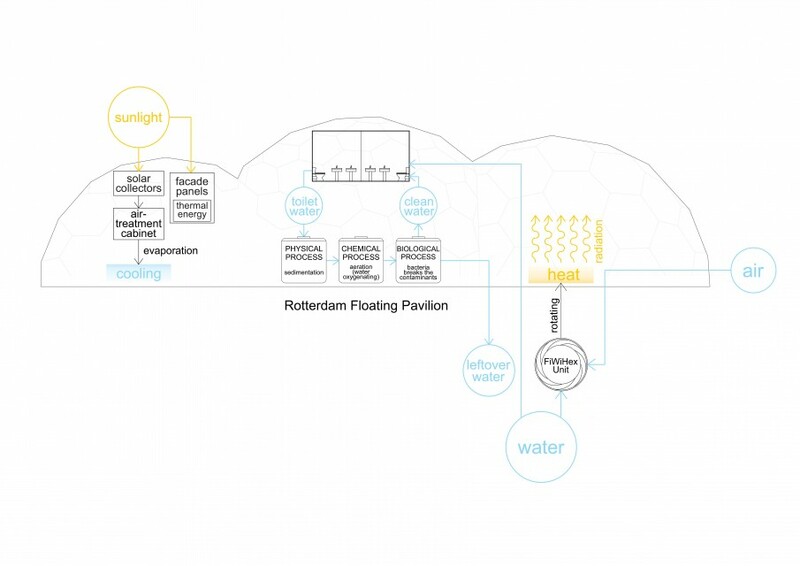 In this way, the Floating Pavilion strengthens the competitive position of the Netherlands water management sector across the board. The Pavilion has a pretty valuable exterior aesthetic value which is above all unique and recognizable. Being an exhibition and conference venue, these qualities are more than useful. Moreover, its facade and shape, although peculiar in a sense, have blended into the environment mostly because of the transparency of the building. Viewed from the shore, it seems as an almost surreal structure, a giant bubble floating on water. The interior is light and spacious, and acts as a kind of medial between indoors and outdoors. The visitor's experience is brought to a higher level, since the tangibility of the experience of floating is undeniable. This brings another dimension to any event held at the Pavilion, and is a step towards the public accepting floating structures as a new way of experiencing space. Many innovations have been incorporated into this project. In terms of both materials, sustainability and construction. 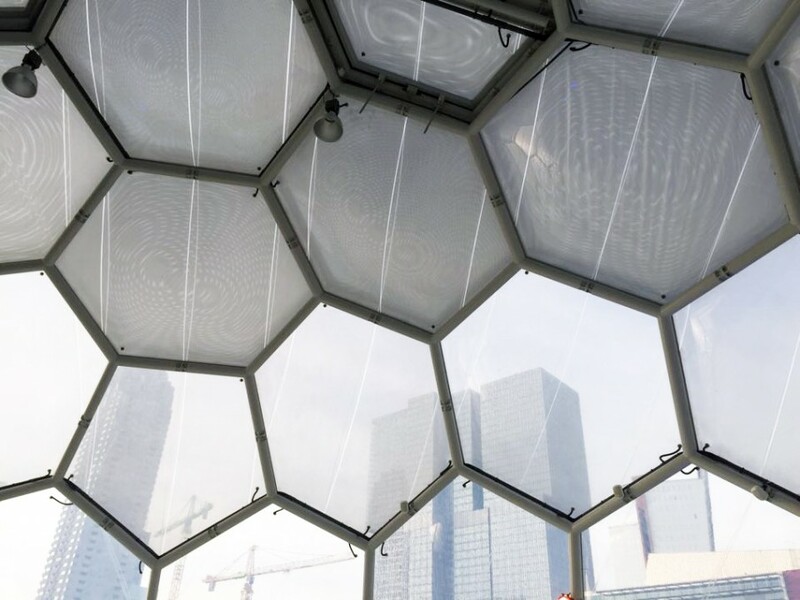 Its facade is composed of modular hexagonal forms, made out of steel and covered with ETFE foil- a material a hundred times lighter than glass, which does not burden the foundation, and is at the same time used as a thermal isolator. The foil is double- layered and filled with air, which contains the warmth inside during the winter and preserves the inner temperature at 21 degrees during the summer. The foundation is a recently patented structure as well, made of expanded polystyrene (EPS) combined with a grid of concrete beams. This construction method was developed and patented by Dura Vermeer and Unidek. The floating foundation enables the structure to be built on water and then shipped to its planned destination. 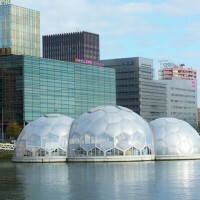 Moreover, the pavilion has offered a possible solution for architects regarding floating structures and their function. The development of a ‘Floating Building’ allows architects, building constructors and public parties not only to learn about ‘how to build on water’, but also; how to transport floating buildings’ and all other aspects related to ‘houses on water’. For instance: Who will be the owner ? How to register this ‘not-just-a-boat-but-certainly-not-a-house-either? How to interpret the municipality city plan (‘bestemmingsplan’) that has indicated the function ‘harbour’ for this area, where now people can sleep, work or meet? The new industrial sea harbor area ‘Tweede Maasvlakte’, located much closer to the seaside, has taken over the role of the City Harbor in the last few years. Now 1600 hectares of the old harbor area becomes available for other activities. 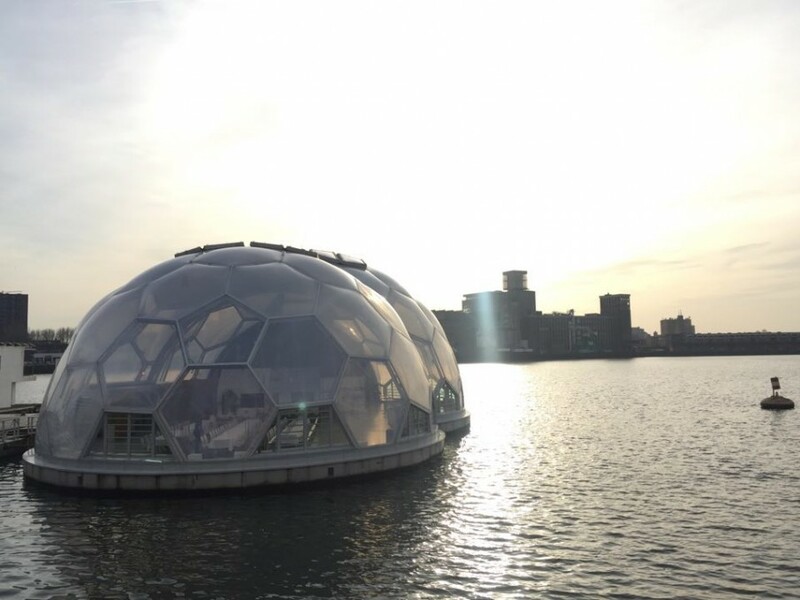 The Floating Pavilion is an exemplary showcase of how future development of the harbor could work as a leisure, public space and accommodation area of tomorrow's Rotterdam.